Some came to burn off a few extra calories, others turned out as a part of their fitness regime and a few simply wanted to show their support for Toastmasters Club 1600 during the annual Ed Carey’s Presidents Fun Run Walk. Dressed in tennis and comfortable clothing, dozens of participants made their way to Curly’s Restaurant at Arawak Cay shortly before 6am Saturday (April 11) for the 46-year-old event, designed to get members of the local community out, about and active. “The Bahamas has a high incidence of chronic, non-communicable diseases like diabetes, high blood pressure and heart disease. Our event promotes the adoption of a healthy lifestyle, whether you’re just starting to get healthy or you’re a fitness fanatic,” said club president, Valentino Munroe. The event takes its name from founding member, Ed Carey, a Distinguished Toastmaster and the ninth president of Club 1600 – the first branch of Toastmasters to be established in The Bahamas. “The annual Ed Carey’s Presidents Fun Run Walk is an event the club looks forward to as we get to engage with members of the local community in a scenic and friendly environment,” Mr Munroe added. As participants registered for the fun run walk, another group held a work-out session yards away and competitive cyclists whizzed past on their bikes. Traveling at their own pace, the route took walkers along scenic West Bay Street to the Office of The Prime Minister while joggers sprinted to the Bahamas Development Bank and back. Dion “Da Butcha” Knowles completed the run with the fastest time of 45 minutes and 23 seconds. “I’m trying to prepare for the Susan G Komen Marathon,” said Mr Knowles who participated in the half marathon in January. First place finisher amongst the walkers was Trevor Brice. He completed the course in 48 minutes and one second. “Usually, I try to stay fit so this was an opportunity to come out this morning, put in a couple miles and sweat a little,” said Mr Brice who heard about the event via Facebook. Meantime, Lauranique Russell’s participation in the fun run walk is demonstrative of her commitment to a healthier lifestyle. 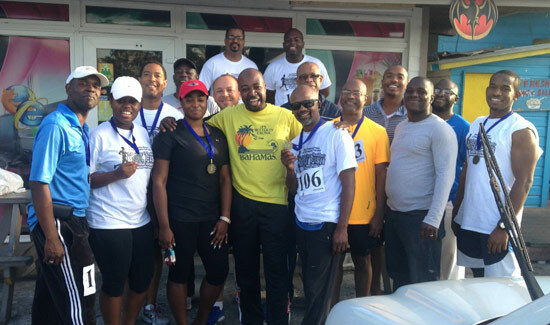 As the fun run walk season kicks off in earnest, vice president of membership Chervez Brown thanked participants for attending. “I’m appreciative of everyone who showed up, supported the event and helped to make it a success,” he said. Immediately following the fun run walk, participants chowed down on boil fish and Johnny cake and took the time to learn more about Toastmasters, a worldwide leader in communication and leadership development. Toastmasters Club 1600 meets 8pm Thursday at SuperClubs Breezes. 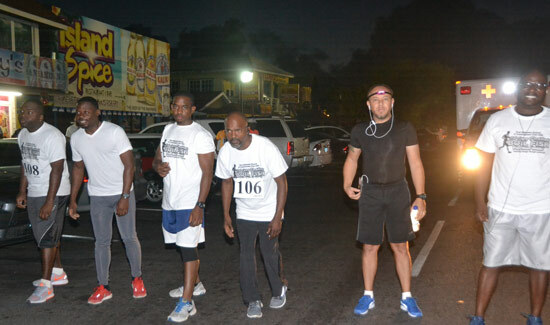 A few runners take their mark at Arawak Cay, during the annual Ed Carey’s Presidents Fun Run Walk hosted by Toastmasters Club 1600.